Diamonds, rubies and jaw-dropping emeralds clamored for attention on an Emmy’s red carpet scattered with macaron-colored ballgowns and sheaths. Thandie Newton, winner of the Outstanding Supporting Actress award for her role in HBO’s Westworld, chose Harry Winston’s secret combination diamond hoop earrings totaling 18.74 carats to accent her orchid-pink Brandon Maxwell gown. Her sleek, center-parted updo showed them off beautifully, and she finished her look with diamond and platinum bands, also by Harry Winston. “I feel like I’m getting married again,” actress Jessica Biel said during a red-carpet interview, a reference to her asymmetrical Ralph & Russo gown, a silk satin organza creation in a becoming shade of off-white. And what bride wouldn’t want to wear Biel’s Harry Winston open cluster earrings—a pair of spiraling, substantial posts featuring 11.48 carats of multi-shaped diamonds—with her wedding-day look? Another lady in white—actress Scarlett Johansson on the arm of her boyfriend, Emmy’s co-host Colin Joust—caught our attention in dramatic Nikos Koulis shoulder-dusting, geometric Universe Line earrings in white diamonds and gold. The pointy shapes and inverted V’s completed the deep neckline of her sequined Balmain gown. 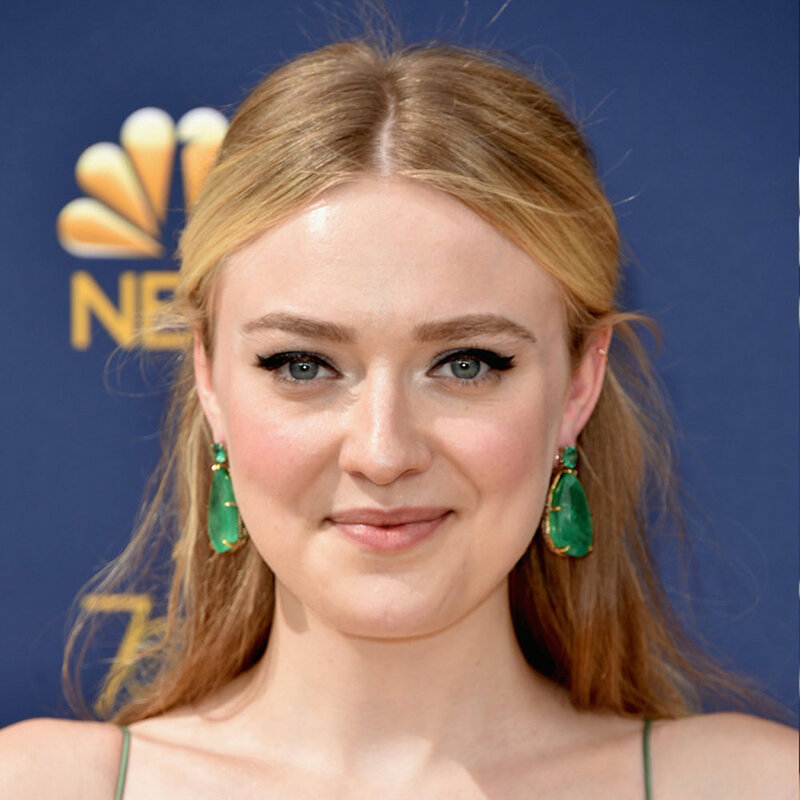 Alienist star Dakota Fanning was a green goddess in a mint-green Dior Haute Couture gown paired with emerald drop earrings that weighed a whopping 175 carats, and matching statement rings, both by Lorraine Schwartz. Plain diamond earrings would have done the trick when it came to Alexis Bledel, nominated for her role in Hulu’s The Handmaid’s Tale, but we love that she wore Harry Winston diamond earrings tipped in pear-shaped rubies with her multi-colored Delpozo gown. The red gems, possibly a subtle nod to Handmaid’s signature color, picked up the garment’s feathered appliqués.